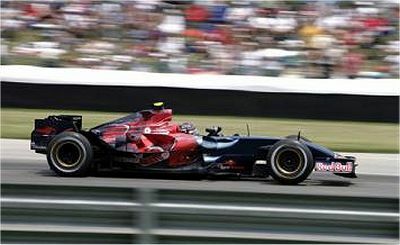 There seems to be a general consensus that Toro Rosso should replace both its drivers for 2008. Apart from the fact that everyone seems to think Liuzzi and Speed have underperformed (and I'd like to know how that is assessed, there being no telling how good or bad the car is until we see an experienced driver in it), it would actually be bad policy for the team to start again with two new drivers. Just ask Toyota. The Japanese company seems to be in the habit of sacking drivers as a team and then throwing new ones together. Their initial choice, Mika Salo and Allan McNish, was rather good and most F1-watchers were surprised when both were replaced after a year. For that second year, 2003, Toyota took on Oilvier Panis and Christiano da Matta, a slightly odd pairing but justifiable at least. Panis had never been as quick after breaking his legs in the Montreal accident of 1997 but he had the advantages of experience to offer the team; da Matta had been very successful in Champ Cars but was still an unknown quantity - too many have failed in F1 after taking that route. These two stuck for a couple of years, occasionally showing that the car had promise but not making any breakthroughs into the big time. Then, in 2005, Toyota came up with their dream team, the super-qualifier Jarno Trulli and the eternally-promising Ralf Schumacher. In contrast to previous years, the company has been loyal to this pairing and Trulli has rewarded them by generally finishing races as well as he qualifies. In the meantime, Ralf has been a disappointment and is unlikely to be retained next year. Looking at Toyota's driver strategy, one has to say that their biggest mistake has been to kick out both drivers when wanting a change. There is no continuity as a result and it becomes hard to assess the performance of the new drivers. It is said that Mika Salo did not get on with the management and that is why he left but, had the team kept McNish for a second year, they would have had an idea of whether their new signing was any quicker. Panis outperformed da Matta but was he really in the top flight at the time? It is impossible to say. And now there are Trulli and Ralf, the Italian making the German look really bad after a long struggle between them, but again we don't know how much is due to the car and how much to the drivers. It could be that Trulli is working wonders with a dog or that the car flatters his racing. Next year I presume that Ralf will be off on his travels and that Toyota will employ one of the new hopefuls to team up with Trulli. Then we will be able to make a fair assessment of real abilities, both of the car and the drivers. To be honest, I've seen too many rookie mistakes from both drivers this year to expect either to be retained. Apart from Scott Speed at Monaco, I can't remember either of them doing anything good. Of course, it doesn't help that the car keeps falling to bits on them (8 DNFs in 7 races is poor reliability, even if some of the DNFs have been self-inflicted) - but the team really does need some fresh thinking. Last year I would have agreed with you, Alianora - both Liuzzi and Speed made a lot of beginner's mistakes. But this year Scott especially has not put a foot wrong - his DNFs are entirely due to collisions not of his making or reliability problems. It is noticeable, too, that he is concentrating on keeping out of trouble, going quickly when he can and finishing races. I am always the optimist where Scott is concerned and I think you will gradually be won over to his cause as the season progresses - he will get better and better, as the car allows. As for McLaren, well, they're such a well-oiled machine that they can break the rules and still come out on top. But Hamilton is only new to F1, not to McLaren (as is so often pointed out). So it could be said that McLaren were going with tried and tested in his case, although I don't believe they knew just how good he is. I heard a rumor ..... I think it was on Dave Dispain's "Wind Tunnel" that Toro Rosso were likely to use Sebastian Bourdais and Brunno Senna in 2008. It's only hearsay, not a prediction, and certainly not from me. much of an example either. Earlier this season, Bourdais looked almost certain for TR, Number 38, but lately there have been suggestions that he'll go to Red Bull instead. I've not heard anything about Bruno Senna in a TR but it's certainly possible. That sounds a very strong pairing but, again, it would be throwing two rookies to F1 at the car and hoping that reputation sees them through. Very often that's not enough and I think TR would do better to have a known quantity in one of the cars.